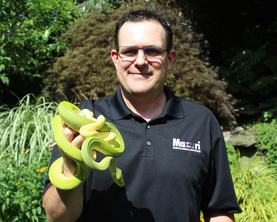 As the Upper Midwest and Canadian Regional Manager for Mazuri, Scott Davis provides technical sales support to zoos, aquariums, veterinarians and private exotic animal owners as well as the PMI retail sales team and PMI feed dealers. Prior to earning a degree in Zoology from the University of Georgia Scott spent several summers working as a Full Time Animal Keeper at the Brandywine Zoo in Wilmington, DE. While at UGA Scott completed an Internship at the Savannah River Ecology Lab participating in natural history field studies of various reptiles and amphibians. Following graduation Scott was an Animal Keeper at the North Carolina Zoo for Five years focused on the captive husbandry and propagation of fishes, amphibians and reptiles indigenous to North Carolina. For the past 18 years Scott has been involved in the Independent pet specialty industry in various roles including distributor procurement and most notably field sales account and team management for several industry leading consumer packaged goods manufacturers selling to the Independent Pet Channel.